In this Article, I am going to show you how to perform clean installation of Mac OS X El Capitan. Have ever you installed Mac OS X El Capitan? If no them you’re in the right place here, I will show and guide you to how to perform clean installation of Mac OS X El Capitan. But perform performing clean installation of OS X El Captain, you need to install it first on PC, Mac, Vmware or VirtualBox. There are many platforms that you can install Mac OS X El Capitan or Yosemite or lower. If you install Mac OS X El Capitan on any one of following platforms then Perform Clean installation of Mac OS X El Capitan is must or necessary. So all you have to install Mac OS X El Capitan on PC, VMware, virtualBox or Macs, by the help of following articles. Use the articles below step by step to install Mac OS X El Capitan then follows this article below step bu step to perform installation of Mac OS X El Capitan that you nearby installed. 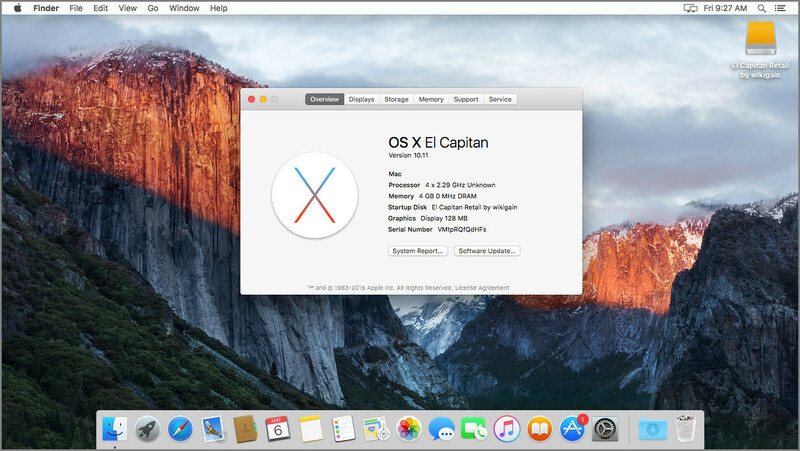 How to Install Mac OS X El Capitan on …? Here you need to go to one of the following articles or links to install OS X El Capitan on that platform. The articles below are our Complete guides to install Mac OS X El Capitan on your platform or you can install it on a Virtual Machine by Vmware or VirtualBox. Remember about installing Mac OS X El Capitan on PC, if your PC fully supported by intel or if it’s compatible with Mac OS X El Capitan then you can install it in an hour. If no then comment us on the related articles below and we will try best for to find a solution. As I mentioned above that, you before performing clean installation of Mac OS X El Capitan, you need to install Mac OS X on a platform like Vmware, VirtualBox or your PC that Windows is installed and based on. I have also given the articles links related to how to installing Mac OS X El Capitan. 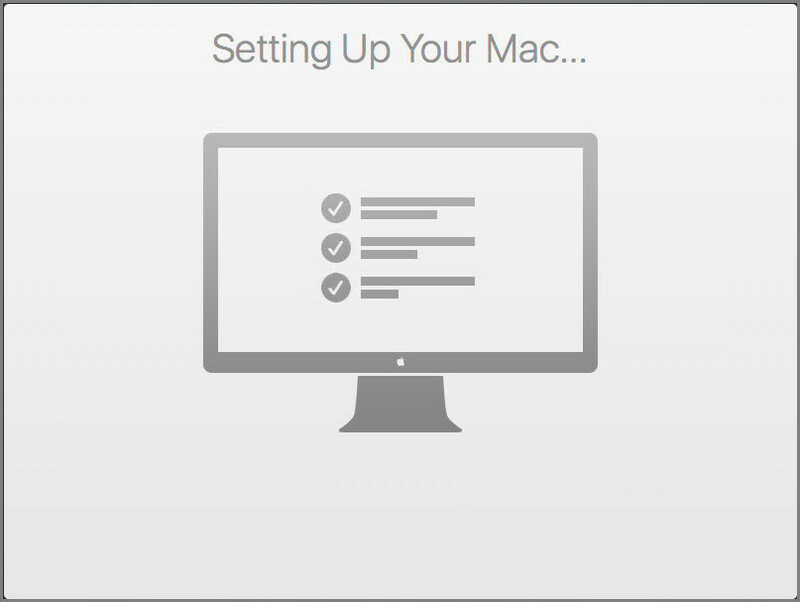 So now if you have installed Mac OS X El Capitan then now it’s the time to perform clean installation of OS X and Setup your Mac. Step #1. Choose your Country and click on Continue. Step #2. 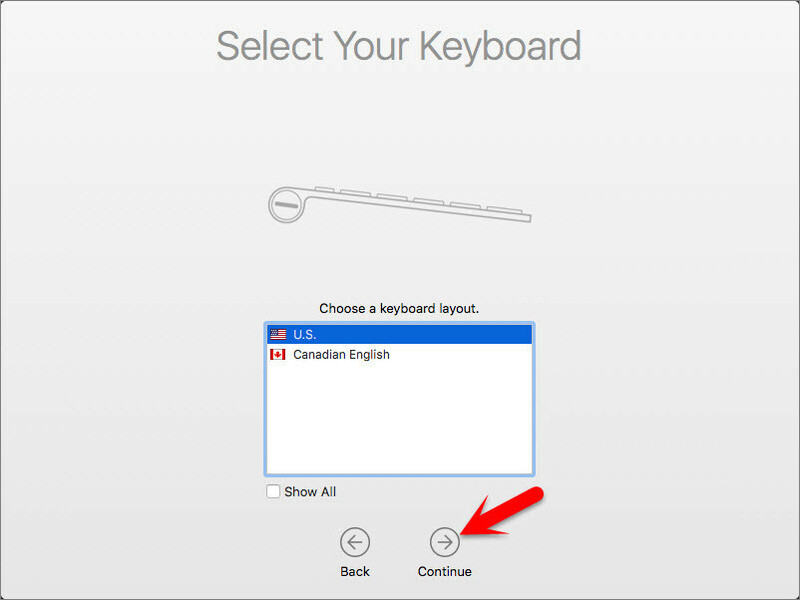 Choose a keyboard Layout and click on Continue. Step #3. 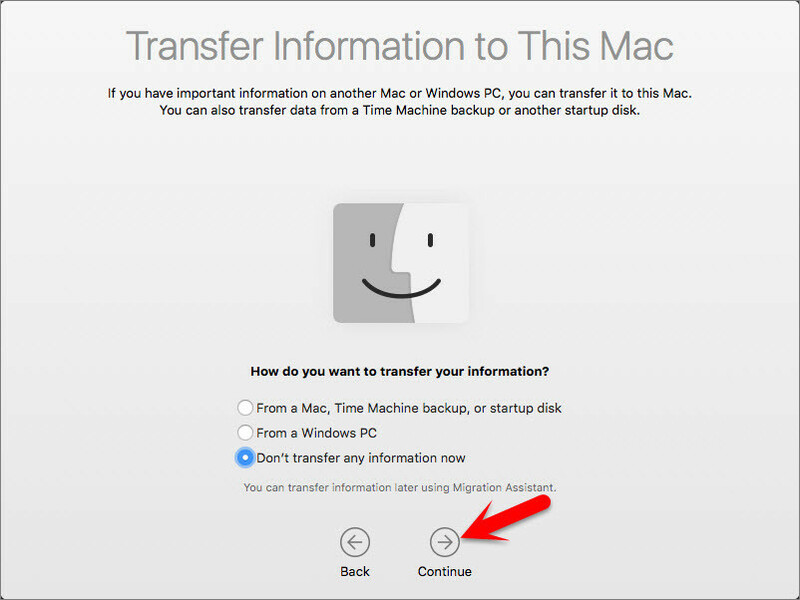 Now select your method to transfer information to this mac and click on Continue. Step #4. 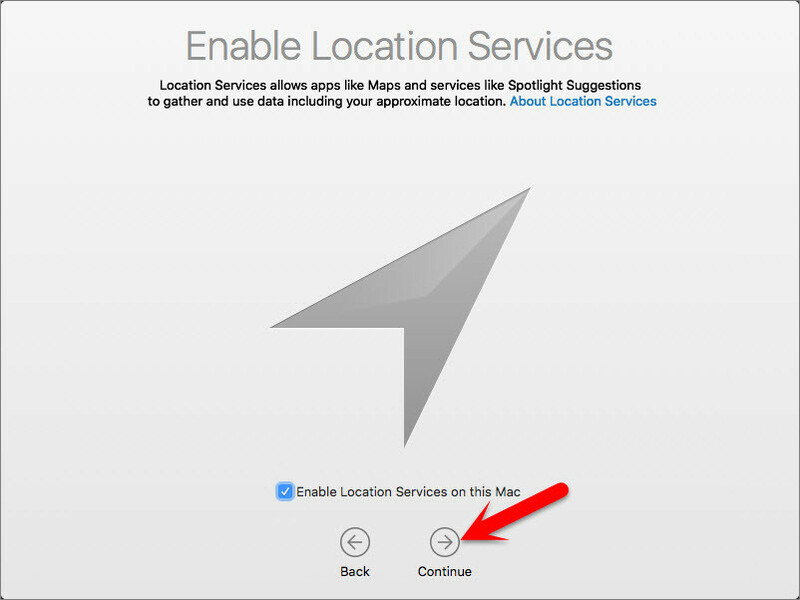 Enable location services and click on Continue. Step #5. In this step, you have to Sign in with your Apple ID. 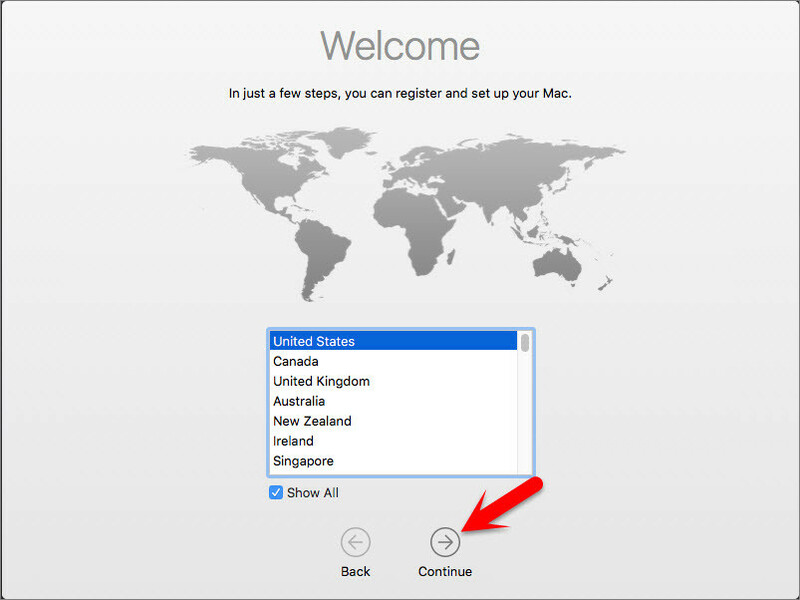 If you have one, then create a free Apple ID by the article, how to create an Apple ID on iPhone, iPad or iPod Touch. 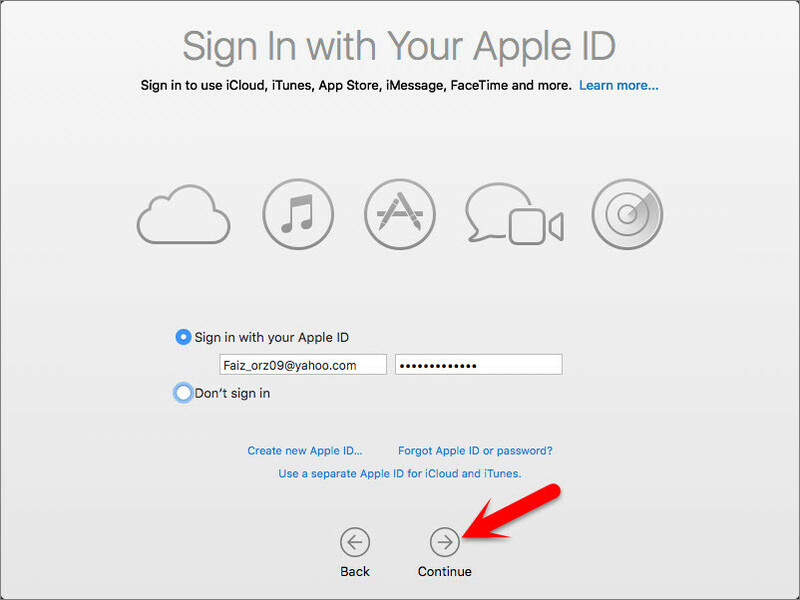 If you don’t want to sign in with Apple ID or don’t want to create Apple ID, then Choose Don’t Sign in and Click on Continue. Step #6. 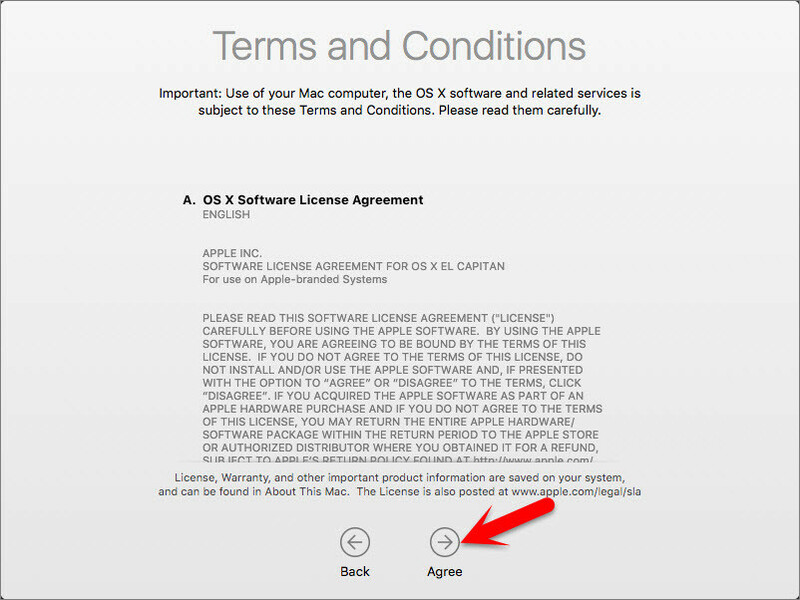 Agree to the Terms and Conditions. Step #7. Fill out the Full name, Account name, Password, Hint and check the box of Set time zone based on Current location. 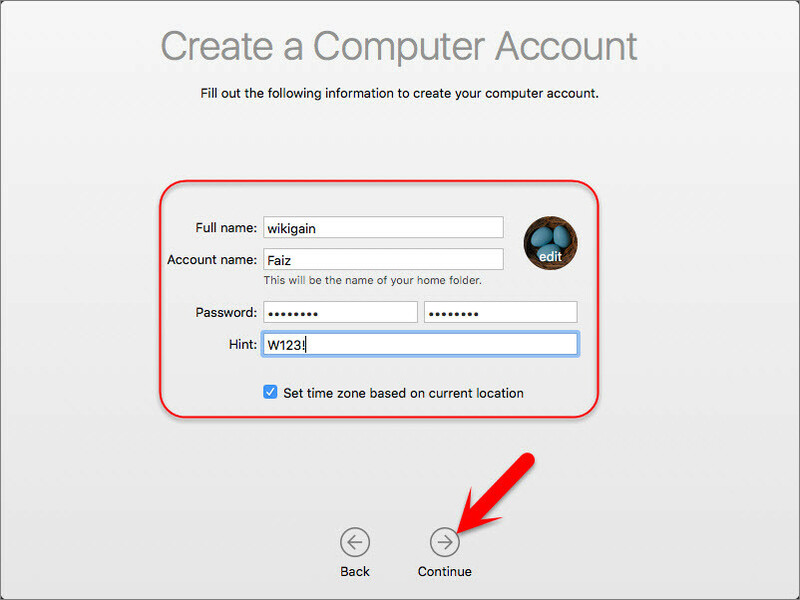 Then finally click on Continue to create your user account for Mac OS X El Capitan, that will be installed. Step #8. 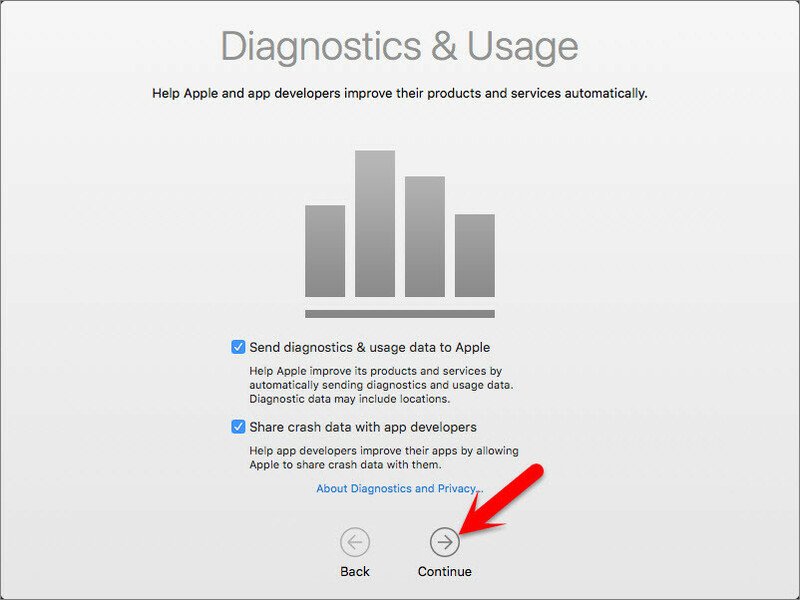 Select the options for Diagnostics & usage and click on Continue. Step #9. Wait a little while to Setting Up Your Mac. Then it will run to the desktop of OS X. After performing a clean installation and Set upping your Mac OS X El Capitan on any platform then you should see your final result that, Mac OS X El Capitan has successfully installed on, no matter if it’s PC, Vmware, VirtualBox or Mac Computers. This was all about, how to perform clean installation of Mac OS X El Capitan. If you faced any problem tell us below by comment, feel free to tell us. we’re waiting for your suggestion.